Bentley, a Cavalier King Charles Spaniel, is in quarantine at a naval air base; his owner, Nina Pham, was diagnosed with Ebola in Dallas. DogTime recently reported on officials in Spain euthanizing a dog for being exposed to Ebola. This week in the U.S., a dog living with a Texas nurse who became infected with Ebola was placed in quarantine. The nurse, Nina Pham, 26, was identified as the first person to contract the Ebola virus in the U.S. Pham, who was caring for Thomas Eric Duncan, the Liberian Ebola victim who died of the disease, got infected through what’s been called a breach in protocol at her hospital while she cared for Duncan. A few days after Duncan’s death, Pham was at home with a fever. She realized she had Ebola symptoms and checked in as a patient at the hospital where she works. 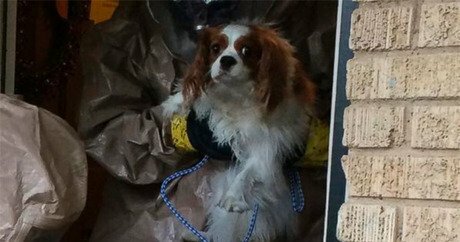 Hazmat workers went into Pham’s home and removed her Cavalier King Charles Spaniel, Bentley. The dog is in quarantine at a decommissioned naval air base. Ebola is zoonotic, but the extent to which it actually affects animals is not well known. According to the Centers for Disease Control and Prevention, scientists believe the first patient became infected through contact with an infected animal, such as a fruit bat or primate (apes and monkeys), which is called a spillover event. Person-to-person transmission follows and can lead to large numbers of affected persons. In the current West African epidemic, animals have not been found to be a factor in ongoing Ebola transmission. There have been no reports of dogs or cats becoming sick with Ebola, even though they may develop antibodies from exposure to the disease. Certainly a greater understanding of the effects of Ebola on dogs and cats is needed. Beyond the more common household pets, some people do keep monkeys as pets. According to the CDC, monkeys are at risk for Ebola. Symptoms of Ebola infection in monkeys include fever, decreased appetite, and sudden death. Monkeys should not be allowed to have contact with anyone who may have Ebola. Healthy monkeys already living in the United States and without exposure to a person infected with Ebola are not at risk for spreading Ebola. Veterinarians and scientists with the CDC, U.S. Department of Agriculture, the American Veterinary Medical Association, and other organizations continue to work together to develop additional guidance for the U.S. pet population.